Internet access in Togo has been severely restricted as opposition supporters gather to protest against the rule of President Faure Gnassingbé. Some users say internet speeds are slow and access to social media platforms has been limited. Protesters have rejected a government proposal to bring about a two-term presidential limit, saying it is a ploy to extend the president’s rule. 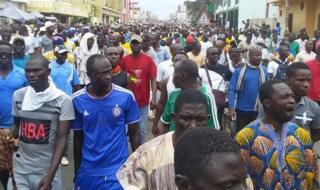 They want Mr Gnassingbé, who has been in power since 2005, to step down. He became president after the death of his father, Gnassingbe Eyadema, who had been at the helm for 38 years. “Even in most developed countries, authorities take control of telecommunications in some cases,” he said. AFP news agency reports that mobile internet had been shut down in the capital, Lomé, but added that wi-fi networks are still working. BBC Afrique’s Ata Ahli Ahebla reports that the demonstrations have begun in many cities and that more are planned for tomorrow. He adds that the decision by the cabinet to propose a constitutional change to bring about a presidential term-limit had not changed the protesters’ plans. The protests have been organised by a coalition of opposition parties and civil society organisations. Local journalist Blamé Ekoué reports that organisers have said that they will not relent in their push for a two-term limit and for the release of some of their members who were arrested, charged and sentenced, after similar protests last week. Police clashed with opposition supporters who were chanting “50 years is too long”.